According to PDG Steve Lemon, there have only been 2 occasions that a RI President has spoken in our district, the last occurring in 2006. 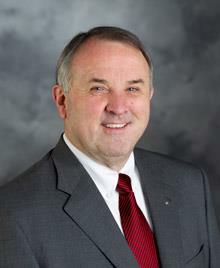 On March 30, 2014, at 5:00 pm, RI President Ron Burton will be speaking at the Double Tree Hotel. We will have a sign up list at our meeting. It would be great if we can at least fill a table of "ten." If you would like to attend this dinner but will miss our next meeting, please let Sherie know. The sooner we make our RSVP, the better table selection we will get. I attended the last "local" presentation of a RI President in Sacramento. It was truly inspiring, and I enjoyed the fellowship with other Rotarians. This will be a fun event. I encourage you to join us.